I’ve been meaning to share this for ages and keep forgetting. 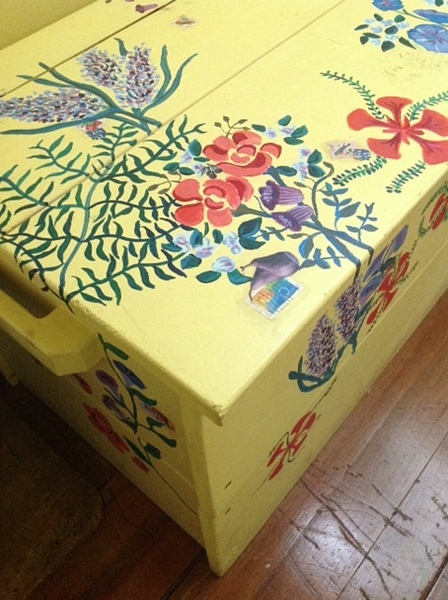 I had the loveliest sense of deja-vu when I laid eyes on this trunk last summer at my friend’s house. At first I thought—cool trunk!—and then I laughed. Years ago I’d painted the flowers on it as a gift to my friend and had forgotten all about it. I can’t remember why exactly, but while I was painting the flowers, I decided to add decoupage, including stamps from that year. Boy do they seem old now (37 cent lick-’em kind!! ), but I like the way they give the piece a date and a context. If you’re interested in seeing some more of my artwork, click here or here. Currently reading: Dear Committee Members by Julie Schumacher. Very funny epistolary novel about the academic life. Also still plugging away at revisions. Beginning to see some light at the end of the tunnel. 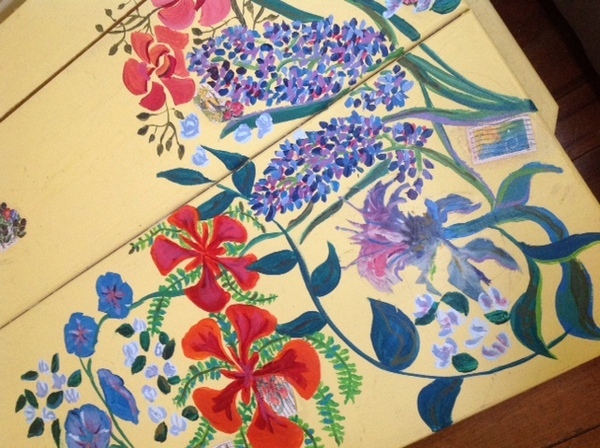 This entry was posted in Art, Crafts and tagged Art, craft, furniture, painting by Emily Smith Pearce. Bookmark the permalink.